Nor can I ever explain what possessed him to blue all his savings he had accumulated towards the enjoyment of one leave, on the invention and patenting of a form of head protection which should supersede the solar topee in the dry season and the umbrella during the monsoons. The author is J.H. “Elephant Bill” Williams, and my friend Vicki Croke, who’s working on a book about Williams, sent me the puzzling quote. How, we wondered, could a native speaker of English come up with the blue in that sentence? And how could the editor of the 1953 book in which it appears have missed it? If Williams had used the past tense, writing “he blue his savings” would look like just a slip, an accidental substitution of blue for blew. But neither spelling makes sense in the infinitive form: “to blue all his savings” and “to blew all his savings” are equally unacceptable. Maybe this blue was chiefly British usage, and maybe, despite its century-long career, it was never truly widespread. But if Burgess could use it in 1963, there's no reason to think Williams's editor, 10 years earlier, would have balked at it -- however odd "he blued it" looks today. *FTC disclosure: Oxford University Press sent me a review copy of Green's Dictionary of Slang. … it was spreading lung cancer that killed Joe Paterno. Amazing how far your mind can race down the wrong fork of a garden-path sentence before the truth catches up with it. A commenter who wants you to post less frequently: With fans like that, who needs critics? RLG is a pro, so I’m sure his response to Uncle Clive won’t be “If you want to develop your own %$@! ideas, write your own %$#@! blog!” But I wouldn’t be surprised if he was thinking it. *I'm assuming (perhaps too charitably) that Uncle Clive's "blogger" for "commenter" here was a slip. Though Ron Paul finished well behind Romney in the New Hampshire primary, he was upbeat: "We're nibbling at his heels," he said. I had never heard this variant on "nipping at one's heels," but it seemed so natural and plausible, I thought for sure it would be in the Eggcorn Database. But no; it's not there, and though the nibbling version gets a handful of Google hits, it doesn't come close to rivaling the standard nipping idiom. That suits my sense of the words; I think of nipping (at someone's heels) as aggressive behavior, like herding sheep or chasing prey. Nibbling, on the other hand, means eating in tiny increments, or at least pretending to eat, and isn't a hostile act. The OED definition: "To take a small bite, or a series of small bites, at or from (a thing); to bite away gradually; to bite tentatively, delicately, playfully, or amorously." The milkcows were nipping the clovery parks (1839). Apparently, though, there have been moments when a writer felt the need of both verbs at once. And because one of those writers was George Meredith,* the OED has also recorded the "rare" word nibblenip, meaning, naturally, "to nibble and nip." The illustrative quote, from a poem of Meredith's (1883): "Haggard Wisdom, stately once, Leers fantastical and trips: Allegory drums the sconce, Impiousness nibblenips." Maybe that's the word Ron Paul was looking for: "We're nibblenipping at his heels!" It does have a certain ring to it. *The quoted lines will hardly recommend him, but Meredith wrote (among many other things) a comic-romantic-feminist novel every bit as deserving of a miniseries as "Jane Eyre" or "Sense and Sensibility." "Downton Abbey" is all very well, but every year I'm amazed that there's still no screen version of "The Egoist." Open wide and say "aqueduct"
Listening to the news this morning, I heard an item about Gov. 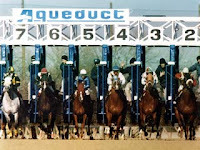 Andrew Cuomo's backing for a proposal to establish a casino at "the Aqueduct racetrack" in Queens. Pronounced AH-kwuh-duhkt,* with the a of "father" in the first syllable. I nudged my husband, a New Yorker whose artist father used to supplement the family income by manning a parimutuel window in racing season. "How do you pronounce that racetrack?" I asked. "AK-kwi-duhkt,"* he said, using the a of "pat" and "sack." That's how I say it, too -- and I'm a Midwesterner with no connection to racetracks beyond a typical history of girlhood horse-craziness. But I don't think I would have noticed the AH pronunciation if the aqueducts in question had been Roman waterworks. Aqua, in my dialect, starts with AH, so aqueduct, when it isn't a racetrack name, could reasonably do the same. But what do I know? According to Charles Harrington Elster, author of "The Big Book of Beastly Mispronunciations," all the AHs would be better as AKs. When he published the first edition of his book, in 1999, the only aqueduct pronunciation American dictionaries recognized was AK-kwi-duhkt, in his transcription, or ˈækwɪdʌkt (IPA, or so I hope as I type). By the time of his 2005 revised edition, he reports, things were changing. Some dictionary editors had been "seduced by the popular, broad-a variant." Not only that -- Encarta and the New Oxford American were listing the upstart first! Most dictionaries, however, "continue to countenance only AK-kwi-duhkt, which has always been and still is the only cultivated pronunciation," he says. Isn't it only natural for the AK of aqueduct to be gradually overpowered by the much commoner AHK of aqua? That's no excuse, says Elster; my AHK-wuh for aqua is just an earlier example of "uncultivated" pronunciation. It wormed its way into American dictionaries only in the 1930s, spread by people who had studied a little Latin and took to pronouncing aqua in what Elster calls a "faux-Latin" style. 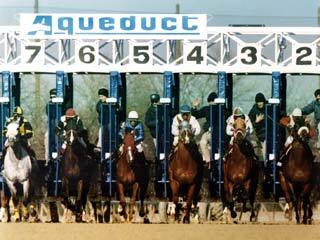 By this account, aqueduct is following aqua down the road to pronunciation hell. I just realized that I use /æ/ for "aqueduct" but /ɑ/ for "aqua", which seems terribly inconsistent of me. The classicist in me insists upon 'a' as in 'father' for both. Oh, weird -- I hadn't thought about it before, but if it's a Roman aqueduct, I'll say it with the "a" in "father," and if there are no Romans in the sentence, I'll say it with the "a" in "cat." Maybe Americans will eventually give all the aqua words an initial AH sound, with New York's Aqueduct, as a proper name, holding out till the last. Or maybe not. If you feel like betting, $2 on Uncle Smokey in the seventh might be a safer play. *Since I quote Charles Harrington Elster below, I've used his phonetic representations. A couple of months ago, I upgraded from a perfectly fine pedometer to Fitbit, which can track not only steps but also (it says) the quality of your sleep, synching it all to your Fitbit log. It works as advertised, but I've been letting it slide lately, with all the holiday distractions. "You don't have any friends." Seriously. I would understand (maybe) if Facebook nagged like this -- FB is all about friends, and I barely check in often enough to qualify as a lurker. But Fitbit's job is to help me keep moving, not prod me to bore my friends (yes, they exist) with daily exercise stats. No doubt there are crowds of Fitbit friends out there, spurring each other to ever higher mileage totals, and if it works for them, who could object? But Fitbit, it's bad manners and bad business to insult customers who prefer not to share. You don't want to be remembered as the guys who put the "bitter" in Fitbitter.